From Oconto, WI to Colorado, this tab takes us from their hometown of Oconto, to Waukegan IL where they were married, to Rockford IL where they spent their first night and then, on to the first leg of their trip out west. After their honeymoon return, this house at 1004 Superior Ave, Oconto would become their new home. Earl was already living at the house and ran his publication “The Daily Reminder” out of this location. The house still stands today. Ethel’s childhood home at the time of their marriage was at the corner of Collins Ave and 4th Street on Oconto’s south side. The house still stands at that location today. 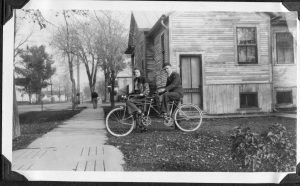 Earl and Ethel were married in Waukegan, IL the first city south of the Wisconsin border. 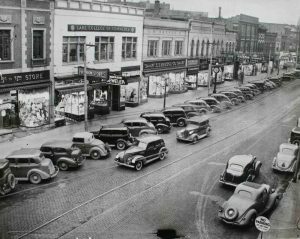 This 1939 photo of a very vibrant downtown was taken by a local newspaper. The scene would have looked very similar the year of their marriage. The marriage was performed by the Reverend August Bartz, pastor of the Immanuel Lutheran Church which at the time was located at 100 Chapel Street seen here in 2012. 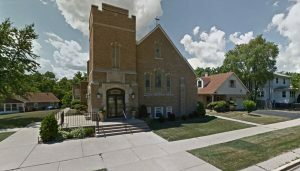 The church is now the home of Latin Pentecostal Church of God. Earl’s Daily Reminder workers covered the marriage July 1, 1937 at this link. The first photo in their album is dated July 1, 1937. Very likely the couple spent their first honeymoon night in the East Side Inn of Rockford IL after driving from Waukegan IL about 100 miles. 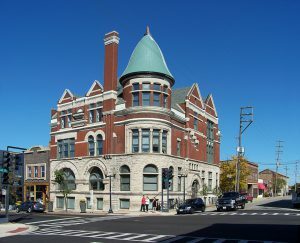 The structure was originally built in 1889 as a YMCA and converted to a 60-room hotel in 1909. 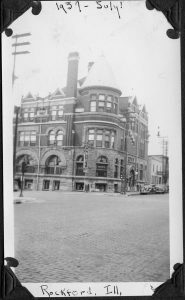 The building is now referred to as the “Old YMCA” and is listed on the National Registry of Historic Places. The 2nd photo is one that this blogger took in 2016. In 1937 the hotel was located directly on US Highway 20. The newlyweds likely continued west on US 20 through both northern Iowa and Nebraska before turning south to Denver in Wyoming. 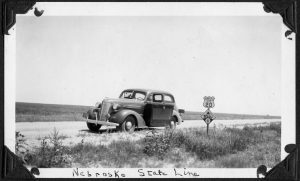 This photo of the “Nebraska State Line” would be at the Wyoming border. The Iowa-Nebraska border crosses the Missouri River. Outstanding. Can you elaborate on your father’s publication and his career? Did he ever publish a run down of his trip, as well? 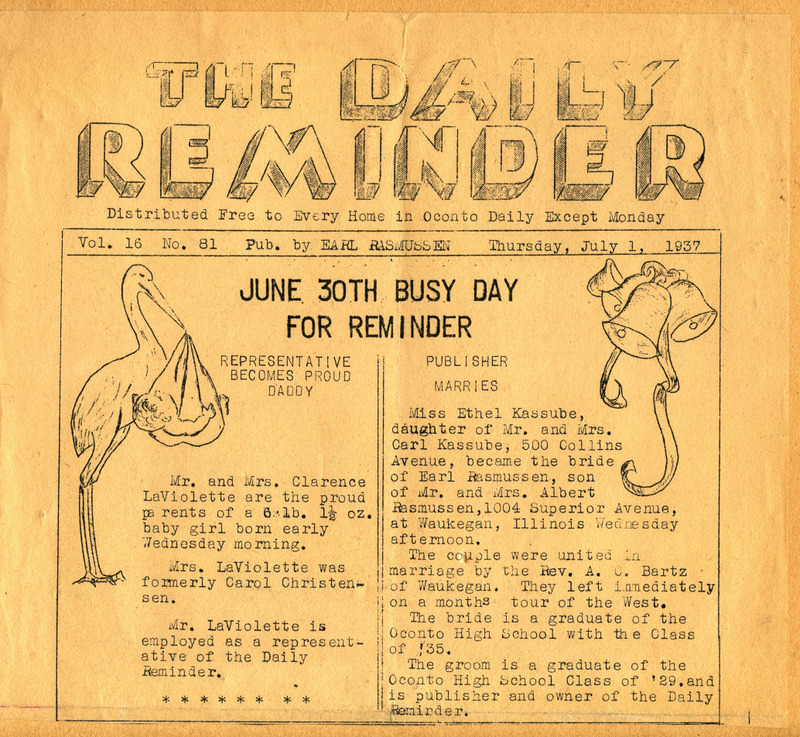 My father began publishing the Daily Reminder in August 1931 when he was 20 years old with his partner Walter Green. The publication in the first year was mostly printed on one side of an 8X14 inch paper. It contained business and personal ads, community announcements, weather forecasts, humor, and “thoughts for the day.” The publication was printed six days a week and distributed free by delivery persons to every home in Oconto (pop. about 5,000). An example of a November 1931 publication is at this link. An example of a March 1940 publication is at this link. I have a bound copy of all of the “Daily Reminders” for 1931 and 1940. Each provide a separate and unique window into the commerce and times of a small town in northeast Wisconsin. Earl later sold the publication to Clarence LaViolette, I believe in the 1940’s. He then went on to set up a furniture, TV and appliance store in the 1950’s. This store was consumed by a large fire in the early 1960’s. The fire began in a feed mill located next door. Earl then joined up as a partner/manager in a local hardware store. He passed away in July 1969. 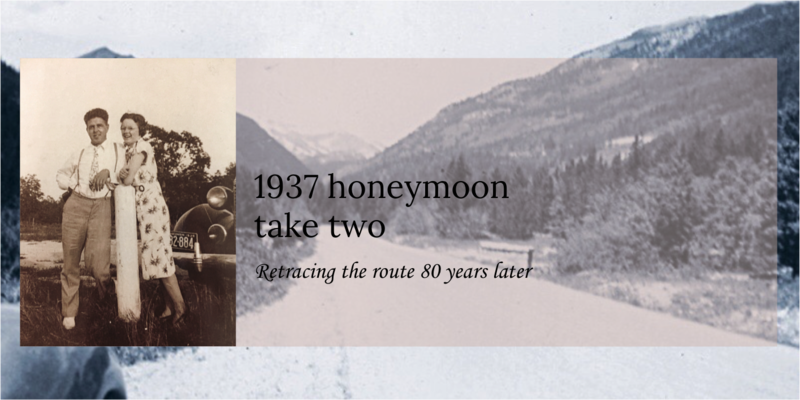 There was no published run down, side notes, or even a map of their honeymoon trip. Only their photo album with about 90 photos, some labeled and some not, is what I had to work with. That is what made piecing this story together such an interesting research, detective, and mystery solving adventure. Mom just called me with your web site address. Wish I had known you were going to be in Oconto. What fun to recreate their honeymoon trip. I never realized Uncle Earl traveled that far!